You have probably heard those phrases and understand the meaning. You see it all the time…a commercial on TV for a 65 inch HD TV for $50, special deal. You fall for it and run to the store to find out they only had one and it was sold (like they really had any at all at that price). Another example is a brand name Ketchup is on sale buy one get one free. You pick up two bottles expecting to get one of them for free. But you didn’t read the fine print….’with the purchase of $100 order’. Oh well, who needs two bottles anyway. The same Buyer Beware is something we ran across during our recent vacation to Maggie Valley, North Carolina. I have used VRBO (Vacation Rentals By Owners) for many years, sometimes three times a year, without a problem. Photos of two bedrooms show wall-to-wall carpeting in both. The guest bedroom shows two twin beds, perfect for the kids. The master bedroom shows a normal looking Queen bed with night stands and a dresser. In reality the guest room now has a Queen size bed, and the master bedroom has one also that is so high my 6 foot tall husband had a problem sitting on the bed. There was no way I, at 5 foot 4 inches, could even get in the bed. We had to use the guest bedroom. The carpet doesn’t exist; there are hardwood floors, which is probably more sanitary anyway. The photos of the kitchen show oak cabinets when in reality the cabinets have been painted red. This is not a big deal, however, it’s not a true representation of what you pay for. We ran into a lot of issues with this rental such as it wasn’t cleaned when we got there at 3 pm to check in. The owner sent a different cleaning person but that meant we had to get back in the car (with the dog) and ride around for another hour or so – after a 4 hour ride to get there – a ride with many twists and turns and ups and downs. After the cleaning lady finished and we were able to unload almost two hours later, we discovered the fridge wasn’t working. This led to many phone calls, us waiting around for a repairman the next day, more phone calls, the promise of a refund of one night and $100 credit for the food we lost. Fridge was finally in-place by 6 pm that Wednesday. 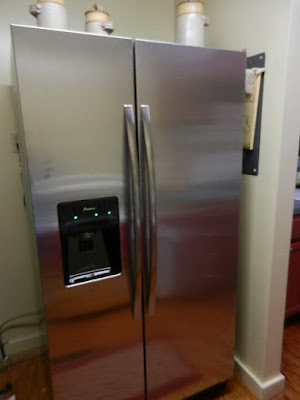 I was told the fridge was ‘new’ and it turned out it was 13 years old. (The owner said she hated to spend the money for a new one.) The new one didn’t fit in the space and the house was a mess with the delivery men in and out and more phone conversations and when it was all said and done we lost two full days of our vacation dealing with things the owners should have dealt with. Did I throw a fit? I sure did, told her we were leaving after 3 days and I wanted a full refund. Once we got the fridge in place and things settled down she promised she would refund all our money plus $100 for food and that we should stay for our full time booked. The ‘old’ photos of the house were taken when the current owners bought it – before they did their updates. The current owners have had it for twelve years. 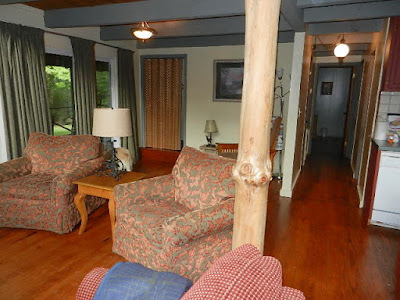 It is a real easy matter to take new photos and post them on VRBO. Show future renters what they are getting not the way it used to look. I must say this is the first rental over all the last 20 years that the photos of a rental didn’t match the rental in person. The next time I rent a vacation cottage or cabin I’ll be sure to ask if the photos are current. In this case it didn’t matter much, but it could have. We did stay and checked out on a Saturday as planned. Did we get our money back? Short answer – most of the money (except the VRBO fee) we paid was refunded…..but the owner didn’t send me $100 as promised. When I asked her about it she said ‘we’re even’. Since our phone conversation was over a landline I had no proof as to what she said, so I let it drop. The bottom line for me is this – I will continue to use VRBO for vacation rentals. I will, however, from now on ask if the photos are truly representative of how the rental currently looks. Maybe if they aren’t truthful about the photos, they aren’t truthful about other things.